Each chapter builds on material introduced earlier in the book, so you can master one core building block before moving on to the next. 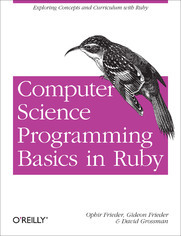 You’ll explore fundamental topics such as loops, arrays, objects, and classes, using the easy-to-learn Ruby programming language. Then you’ll put everything together in the last chapter by programming a simple game of tic-tac-toe. 2. How Does the Computer Really Work? 3.3 What Is a Variable?